In 1972 Minolta released a new version of their Hi-Matic consumer rangefinder cameras, the HI-MATIC F, with the less sophisticated 38mm (f2.7) Rokkor lens. It had a lighter (350g compared with 560g) and more compact camera body than the Hi-Matic E, and was less costly, with fewer features. The rangefinder had only parallax marks, no mechanical parallax correction. The CdS meter did control exposure time and aperture. The camera had a flash guide number selector which provided an automatic aperture control depending on the distance for flashlight photography. 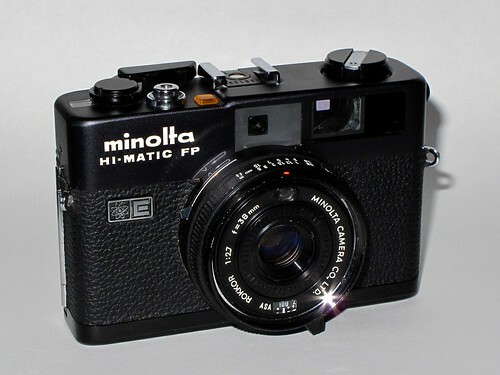 Along with the silver and all-black HI-MATIC F variants, Minolta also released a black-bodied version that they called the HI-MATIC FP. There is speculation that the "P" stood for "Professional", because at that time, black bodied cameras were considered more professional. However, the black FP was identical except for the inclusion of a self-timer.